One of my favorite things to thrift is something very cheap that can easily be made over. 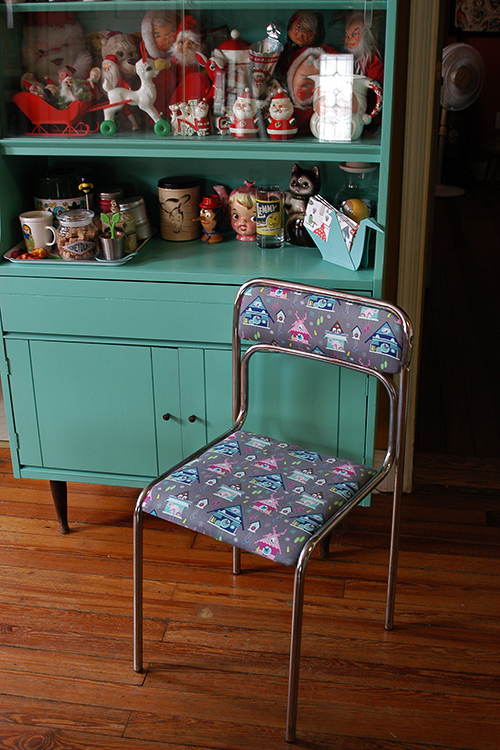 I really needed some extra chairs for this last Crafternoon so I was on the lookout that week while thrift shopping. My sister pointed out this chair that was for sale for $1. It was covered in some bad brown vinyl and had a few rips, but it also looked like it would be easy to unscrew and re-cover which is exactly what I did! I used the fabric Kelly Lee-Creel Storybook Lane Cuckoo Clocks which I love. I had a half yard which worked out perfectly. If you have any thrift shop before/afters please link them in a comment, I’d love to see! Tagged makeover, thrift. Bookmark the permalink. what kind of fabric did you use for the recover? vinyl? either way it looks great! I really need to go antique/thrifting soon. I am jonesin! is that the paper crane napkin holder from target? I love that thing. I spied that, but couldn’t justify buying it. I love the chair make over. You are so darn awesome. We do alot of DIY and refurbishing around here too, I just need to get better about blogging about it. I am new to the blogging thing, and I’m having a hard time remembering to document everything, and it’s just not the same without pictures. I’ve been reading your blog for years, and I find it all so inspiring. Terrific job of making a boring chair into one that’s really special! Crochet is my craft and lately I’m loving this trend towards covering up old stools with crocheted slipcovers. You’ve shown another option for a similar thing. God your blog is just EXHILARATING, Heidi! The life you lead couldn’t POSSIBLY be more lovely! What a great makeover. I have a chair I want to redo but I’m not sure if it would be as easy to recover as yours but um not giving up yet. I just love yours. crochetblogger, thanks! I love the look of crocheted tops for stools–thats great!! I have a remake! I got this desk from craigslist almost six years ago (there’s a before photo linked in that post), and I finally got around to refinishing it this spring. 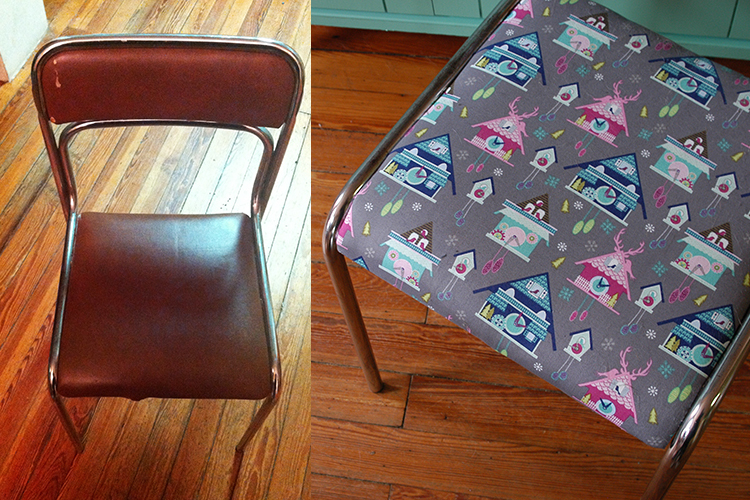 The chair came from a thrift store, and that was another sanding/staining project. (The triangle wall wasn’t thrifted, of course, but that was a long DIY project, too.) I love how your chair came out!